Speaking to Virgin Islands News Online yesterday February 27, 2015 one of the show’s organisers Adell J. Semper said that the event will be strictly about Virgin Islands' food, beverages, artists and music of all genres. 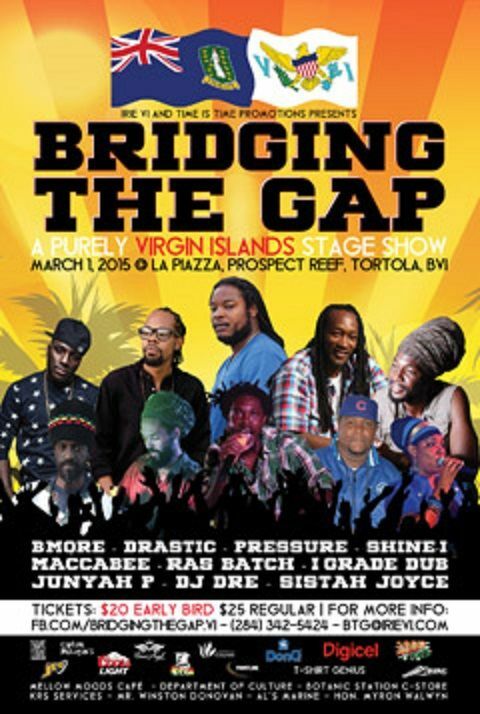 On Sunday 1st March, 2015 at La Piazza, Prospect Reef, 'Time is Time Promotions' and 'IrieVI Entertainment' will host a stage show consisting of purely Virgin Islands' artists, musicians and entertainers. 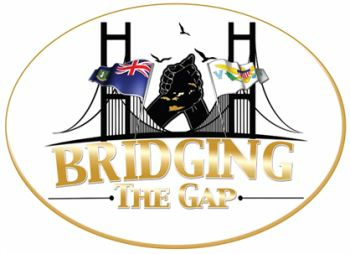 The show is slated to be an annual one and has been dubbed, “Bridging The Gap”, in recognition of the longstanding relationship of the two sister territories – The Virgin Islands and the United States Virgin Islands. The event has been created with the vision of showcasing Virgin Islands’ artists and musicians of various musical genres, while nurturing their local fan-base and encouraging the display of Virgin Islands’ pride. In an effort to wholly embrace the two territories’ intertwined cultures, the evening’s activities will surpass the element of music as attendees will also be allowed to enjoy Virgin Islands’ cuisine with a fish fry, vegetarian selections and local drinks. Artists slated to perform at the event are: Junyah P and Ras Batch out of St Croix and Pressure out of St Thomas. Representing the VI are: B’More, Drastic, Maccabee, Sistah Joyce; and Shine-I. “The show is on Sunday but we will be having a meet and greet [today February 28, 2015] at Captain Mulligan’s from 7:00 PM to about 11:30 PM. So persons are encouraged to come down and meet with the artists and take pictures,” she said. “The performances will be set in two main phases. We will have the BVI artists who will be performing with Young Blood and Crew, and then the USVI artists will be backed by I-Grade Dub,” she said. She explained that I-Grade Dub was set up by Laurence Alfred, who is the main producer at I-Grade Records and the person who produced Pressure’s second to last album ‘The Sound’. “I-Grade Dub only uses live recording, so his music…his instrumentals are never compiled on a mixing board. You would have a live band sound coming from I-Grade Dub. It is something new and something different as far as stage production goes,” said Semper. She explained that this show will be one with a difference as patrons will quickly realise when they get there. “What will be different when you come to the event is that it will be a very festive environment. It is not going to be anything like when you go to a typical stage show and the DJ runs his music before and the artists come on and you’re waiting for the main event,” she said. She said that they have deliberately not put one artist out in front of the others. “There are some people coming to hear a particular artist for sure. Some people are coming to hear the local artists, some of them coming to hear Pressure as he has a large following. But we are trying to do it in such a way so that when people hear Bridging the Gap, they wonder which artist might be featured this year,” Semper said. She said too that apart from their usual bar which will be named Spark City, they will be having their 'Drink VI' promotion featuring drinks from the Greater Virgin Islands. “When you come over to the 'Drink VI' promotion all of the drinks there will originate in the VI,” she said.